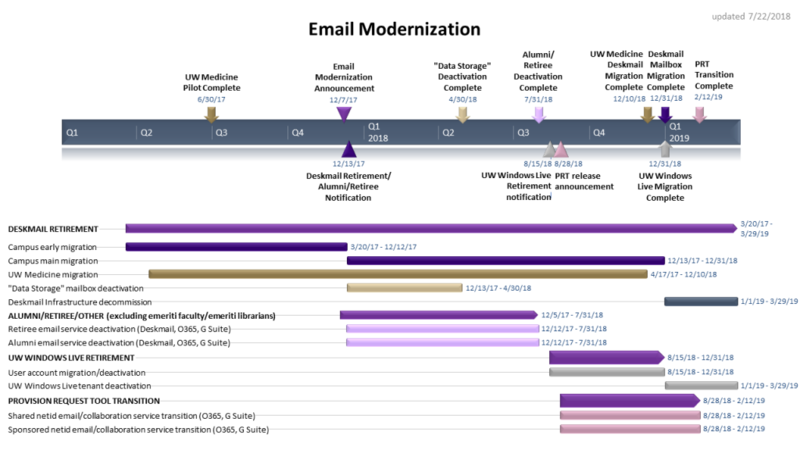 The UW is embarking on a program to modernize its email and productivity platform services – the Email Modernization Program (EMP). The goals of the EMP are to ensure that current students, faculty, staff, and UW Medicine workforce members have access to the latest email and productivity platform services at their disposal, to facilitate responsiveness to records requests, and to protect sensitive data. Read on for information about the program timeline and resources available to support users as they transition to new email and productivity platform services, and see the EMP FAQ. December 7, 2017: Official announcement of Email Modernization Program, including UW Deskmail retirement and Alumni/Retiree email service deprecation. April 30, 2018: Access disabled and any remaining Deskmail “Data Storage” mailboxes deactivated. “Data Storage” users must complete mail migration (as desired) and manual account deactivation prior to this date. July 31, 2018: Retiree, former staff, alumni, and former students UW Deskmail, UW Office 365, and UW G Suite email and productivity platform services deactivated and all data deleted. Users must complete migration of de minimis personal email and data (as desired) to a private email and productivity platform service prior to this date. December 31, 2018: UW Deskmail and UW Windows Live accounts and data deleted. Current employees must complete email and productivity platform data migration prior to this date. UW Deskmail (aka UW Email, Alpine, Pine) will be retired for the entire university on December 31, 2018. Access to accounts will end and all data will be deleted as of that date. Users of Deskmail are responsible for migrating their email and files, taking care to preserve UW records according to records management guidance and the General Records Retention Schedule or the UW Medicine Records Retention Schedule. Retirees (with some exceptions noted below) and former staff are no longer eligible for a UW email service, including users of UW Deskmail, UW Exchange Online, UW Gmail, and UW Outlook Live. Access to the accounts ended and all data were deleted effective July 31, 2018. Ability to access or log in with their UW NetID is not affected, nor will their ability to forward their UW email address to a private email service. Within 30 days of separation, upcoming retirees and separating employees, including student employees, need to work with their home department or unit to remove and retain official UW records, taking care to preserve UW records according to records management guidance and the General Records Retention Schedule or the UW Medicine Records Retention Schedule. After 30 days, they will no longer have access to the account, and all data will be deleted. As UW policy allows for de minimis personal use, they will also need to migrate any personal files and email to a personal service if they wish to preserve them. They may not migrate any official UW records to a personal service. All retirees using any UW email services need to work with their former home department or unit to remove and retain official UW records, taking care to preserve UW records according to records management guidance and the General Records Retention Schedule or the UW Medicine Records Retention Schedule. They will also need to migrate any de minimis personal files and email to a personal service if they wish to preserve them. They may not migrate any official UW records to a personal service. Access to the accounts ended and all data were deleted effective July 31, 2018. Emeriti faculty and librarians will have continued access to UW Exchange Online (and UW Office 365), and UW Gmail (and UW G Suite). If they are currently using UW Deskmail (aka UW Email, Alpine, Pine), they will need to migrate to either UW Exchange Online or UW Gmail. Other former employees or retirees may continue to use a UW service if they are provisioned for access by a current UW employee as still performing a service for the UW. See here for more information. Alumni and former students are no longer eligible for a UW email service, including users of UW Deskmail, UW Exchange Online, UW Gmail, and UW Outlook Live. Access to the accounts ended and all data were deleted effective July 31, 2018. Ability to access or log in with their UW NetID is not affected, nor is the ability to forward their UW email address to a private email service. On the 10th day of the second quarter in which they are not registered as a student, graduating and departing students will receive an email notification that their computing services, including their email account, will expire in 14 days. After the date of the email notification + 14 days, they will no longer have access to their email account, and all data will be deleted. They will need to migrate any personal files and email to a personal service if they wish to preserve them. They may not migrate any official UW records to a personal service and must work with their home department or unit to remove and retain official UW records, taking care to preserve UW records according to records management guidance and the General Records Retention Schedule or the UW Medicine Records Retention Schedule. Those currently using a UW email service should migrate personal files and email to a personal service if they wish to preserve them. They may not migrate any official UW records to a personal service and must work with their former home department to remove any remaining official UW records, taking care to preserve UW records according to records management guidance and the General Records Retention Schedule or the UW Medicine Records Retention Schedule. Access to the accounts ended, and all data were deleted effective July 31, 2018. Alumni and former students may continue to use a UW service if they are provisioned for access by a current UW employee as still performing a service for the UW. See here for more information. Please contact the UW Information Technology Service Center at help@uw.edu if you have further questions.